Here's to the coming of the light! Around our house, with the last belief in Santa shorn this year, we view our holiday season in the old-fashioned way: a celebration of the coming of the light. This is a big deal in Seattle where short winter days and thick overcast skies can make one yearn for light and heat. Especially this year. My daughter and I typically have the responsibility, as we put it, for, doodling with multi-colored holiday strings of lights on the trees, bushes, fence and house walls to do our neighborly part in kick-starting the New Year. What a good time to celebrate action in 2006 that suggests an increase of the light for better integrated care as 2007 dawns. Here is the Integrator Top 10 for 2006. I selected these for their potentially foundational impact on the inclusion of integrated services in the betterment of people's health. If you missed the full stories, I provide links. Send me your comments and any actions you would like to honor that are not included here. Congratulations to these leaders for these advances. Happy holidays! Through all the robust work of the last 30+ years, no part of integrative care, of holistic medicine, or of any complementary and alternative medicine field has ever gained official sanction from a major, dominant healthcare discipline. In November, the American Nurses Association, representing the nation's 3-million nurses, formally accepted the application of the 3,200 member American Holistic Nurses Association to be a recognized specialty society. Carla Mariano, RN, EdD, AHN-BC, led the effort. Holistic thinking and practice has a seat at nursing's table. CAM professionals fields have focused on relationship-building with medical doctors. Perhaps we would do well to spend more energy working with the largest organization of, if this action speaks a trend, healthcare professionals. Integrator article here. 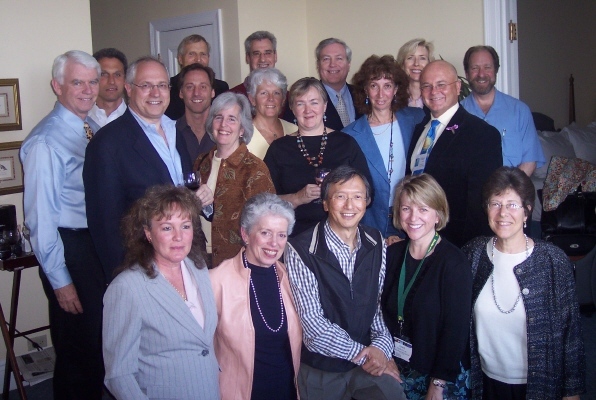 Six years ago, Integrator advisor Clyde Jenson, PhD, gave a multi-stakeholder group at the first Integrative Medicine Industry Leadership Summit a simple phrase: Those who are educated together practice together. Last May, a small but significant step in toward "education together" was taken when the executive committees of the Consortium of Academic Health Centers for Integrative Medicine (CAHCIM), representing 36 conventional medical schools, and the Academic Consortium for Complementary and Alternative Health Care (ACCAHC), representing educators from a half-dozen licensed disciplines, plus, met in a joint reception in Edmonton. The development of these relationships, between individuals and organizations, suggests the potential for a future when these educators might better model multi-disciplinary activity in their institutions. A recent payoff: CAHCIM invited ACCAHC to serve on the planning team for the next North American Research Conference on Complementary and Integrative Medicine. Patients will only benefit if we know each other better. Integrator article here. In-patient integration of natural health care has typically been a zone defined by a little Reiki, a little music, a fountain, a family room, some healing touch and perhaps, for the outrageously adventurous, a bit of MD-delivered acupuncture for pain. Such integration is controlled, typically, by a constitutionally suspicious toward alternatives, conventional medical mind. At Los Angeles' Good Samaritan Hospital (GSH), acupuncture will be fully-embraced as a partner to conventional medicine in improving patient outcomes. According to project manager Jeannette Painovich, LAc, DAOM, rather than "protocol acupuncture" which limits acupuncture practices, Good Samaritan will allow licensed acupuncturists, working with their medical counterparts, to put their needles to work as they best know in helping patients across a broad band of cardiovascular, neurological and musculoskeletal conditions. The project, funded late in 2006, will look at satisfaction, clinical outcomes and potential cost savings. Notably, GSH is partnering with Emperors College of Traditional Oriental Medicine to provide the services. Integrator article here. When the American Medical Association's strategists for their Scope of Practice Partnership began planning their campaign to limit the scopes of other fields, the planners most likely failed to foresee a certain unintended consequence. They immediately stimulated organized opposition, likely foreseen: the American Nurses Association - the AMA's increasingly unruly bigger sister - organized the Coalition for Patient Rights (CPR). That multi-disciplinary group originally included most allied health fields, plus the limbo-discipline, chiropractic. Unforeseen by the AMA was that, within months the American Association of Oriental Medicine, the American Association of Naturopathic Physicians, the Integrated Healthcare Policy Consortium and the Academic Consortium for Complementary and Alternative Health Care had each joined CPR. We know that war is often the father of invention. What the AMA created by its ill-advised and thus far non-evidence based war was the Mother of All Health Healthcare Coalitions. Virtually everybody but the AMA is involved. One only hopes that the group will begin to feel its combined power, deal with its own internal rifts (easy to say!) and see what it can move as a proactive coalition for health reform. Integrator article here, and for a list of six related Integrator articles, here. Last May, and also in Edmonton (see #2 above), the International Society for Complementary Medicine Research (ISCMR) produced a forum on a critically important topic at the first North American Research Conference on Complementary and Integrative Medicine (a historic gathering which merits mention on this list). As part of the gathering of over 600 researchers, ISCMR focused attention on methods for engaging what the organization calls "whole systems research." In short, how do we measure the impacts of care that engages the whole person? Notably, Integrator readers strongly support such a direction for research investment. (See "Readers Say Research "Whole Practices" - NCCAM Needs Focused Program"	.) In November, the Journal of Alternative and Complementary Medicine worked with ISCMR to sponsor a forum on whole systems research issues. Participants underscored the political and economic challenges of getting research funded and then published if researchers look at the whole practices and whole processes which typify whole person treatment. Whether this informal gathering will gel into an active special interest group or organization is not yet clear. What is clear is that whole practices and whole systems need such organizational attention and visibility. Integrator article here. No one who explores the question doubts that large employers (including government) are the non-consumer healthcare stakeholder interest which has the most to gain from forging better integration of natural healthcare professionals and disciplines into the care their employees receive. The strengths of complementary and alternative health care, as proclaimed in convention hot-tubs around the globe, are precisely in those areas which can positively impact the global costs of health: patients feel better, become more functional and more productive, and limit their needs for more expensive and debilitating pharmaceuticals. Under the direction of Integrator advisor Kenneth R. Pelletier, PhD, MD (hc), the Corporate Health Improvement Project (CHIP) will, in this third round of CHIP activity over 20 years, focus expressly on integrative medicine strategies. (The recently engaged pilot project led Bernie Noe, ND, with naturopathic doctors in Vermont merits mention here as an employer-based model currently underway.) Integrator article here. With a few rare exceptions such as the Cancer Treatment Centers of America hospitals, integration, where it exists in inpatient care, is piece-meal, poorly coordinated and often failing even to make it into a hospital's strategic plan. A decision this fall by the New York Beth Israel Hospital (NYBI) changes this pattern. Woodson Merrell, MD, will become the first director of integrative medicine for the hospital's new Department of Integrative Medicine. Like the decision of the ANA to accept holistic nursing, this action gives integrative medicine a seat at the table in that large, influential health system. Merrell and his colleague at the Continuum Center for Health and Healing will help advise, coordinate and build services across diverse disciplines at NYBI and the other Continuum Health Partners hospitals. Here's hoping other hospitals will have their competitive juices riled - or better yet, actually see the value for doing so themselves as part of a strategic plan to limit errors and become more patient centered. Integrator article here. An ugly little secret among the CAM and integrative medicine professions is the challenge of developing business models that work. Boutique practices only reach a small population, and require the talents of but a limited number of available practitioners. Huge populations are not served. Yet a high percent of those licensed are either seeing few patients or have left their fields. Into this little house of horrors stepped Working Class Acupuncture (WCA)offering acupuncture in community rooms, on a $15-$35 sliding scale and without participation in insurance. In October, the first meeting of the Community Acupuncture Network (CAN) drew 40 individuals who are developing similar practices in 22 states around the country. The coming year will see how well some of these models will take off and sustain as an ongoing part of acupuncture care. Meantime, the model has stimulated a good deal of useful dialogue and encounters with our shadows as the difficult economic issues for practitioners - and not just in the AOM fields - are outted. Thanks to the acupuncture field for "going first." What might new models be for other disciplines? See Integrator article here and respondent commentary from a dozen readers here and here. The uptake of CAM into conventional practice and institutions is accompanied by two demands: show me the evidence and show me the money. Unfortunately, few integrated health researchers or entrepreneurs (for profit or not-for-profit) take the latter to heart. An exception is Integrator sponsor Alternative Medicine Integration Group (AMI Group), which from the get-go has pursued capture and analysis of financial cost-benefits as part of its business plan. Led by Jim Zechman and Richard Sarnat, MD, the AMI Group's seven-year outcomes from its unusual integrative independent practitioner association, under contract with Blue Cross Blue Shield's HMO-Illinois in Chicago are compelling. As compared to the HMOs norms, AMI's members had 60% fewer hospital admissions, 59% lower hospital costs, 62% fewer outpatient procedures and 62% lower costs on pharmaceuticals. This business model remains a beacon to others. Why don't more of you look at cost issues? Integrator article here. In a year in which NIH-funded research on natural products continues to both question the value of herbs as captured in randomized controlled trials (and stir controversy over the research designs which led to negative outcomes), the dietary supplement industry appears to have been successful in its first national legislative effort in a decade to collectively show itself as a responsible part of the healthcare community. The passage of the Adverse Events Reporting (AER) bill, otherwise known as the Dietary Supplement and Non-Prescription Drug Consumer Proterction Act, was backed by the leading organizations representing the industry. The United Natural Products Alliance, the Natural Products Association and the American Herbal Products Association all promoted proactive engagement in a level of scrutiny which is an entry requirement in US healthcare. The bill, passed as the last act of the 109th Congress, may well also call the bluff on antagonists who claim that natural products are frequently involved in adverse events. Integrator article here and here. Comment and an Addendum: As I reflect, there is much that points to the coming of the light amidst the struggles that have characterized integrated care in its first decade. For the impatient, the road is always a traffic jam. Why weren't we here a decade ago? My bully-pulpit comment sections must reach some of you who are on the ground, wrestling to better your small corner of this $2-trillion plus juggernaut, as obnoxious horn-honking. Hold your horses, you jerk! But looking back, even over one year, we can see these important ways that the multi-disciplinary and multi-stakeholder effort toward better integrated care has gained ground. I would like to add here, in a spirit of utter self-promotion, the important contributions to lighting a few candles in 2006 from the NCMIC Group (Lou Sportelli, DC), Triad Healthcare (Agostino Villani, DC), Standard Process (Charlie DuBois and David Barnes, PhD) and Alternative Medicine Integration Group (Jim Zechman and Richard Sarnat, MD). Yes, these are the Integrator sponsors. These are the individuals and companies without whose generous and mission-focused sponsorships the Integrator would never have seen the light of day when I was first considering organizing this newsletter and networking site late last winter. Click on their banners on the upper right of the site to visit them. If you like the Integrator, let them know. Of course, my holiday wish is that they renew in 2007! ... and that I find a couple more sponsors to make the Integrator business model actually sustainable. Here's to the coming of the light - even if the form it takes is cash! Credit: Photo of dawn from ilind.net. Disclosure, aka, alignment of interest statement: I was intimately involved with the meeting of the two academic consortia (#2) as director of the National Education Dialogue to Advance Integrated Health Care, and the company mentioned in #9, as noted, is an Integrator sponsor. Close readers of this Top 10 will also note that actions led by a number of Integrator editorial advisors are also honored here. I attribute this to my good luck in having the editorial involvement of individuals who are leaders in the field.